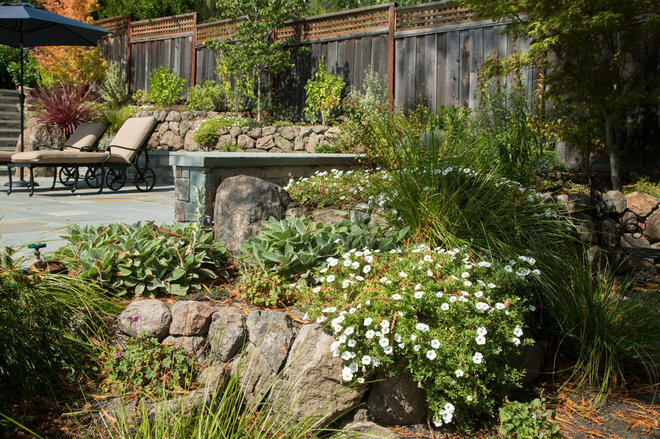 Greg and Rebecca Ahearn moved into a 1950s home in Ventura County and went to work making their backyard multipurpose. 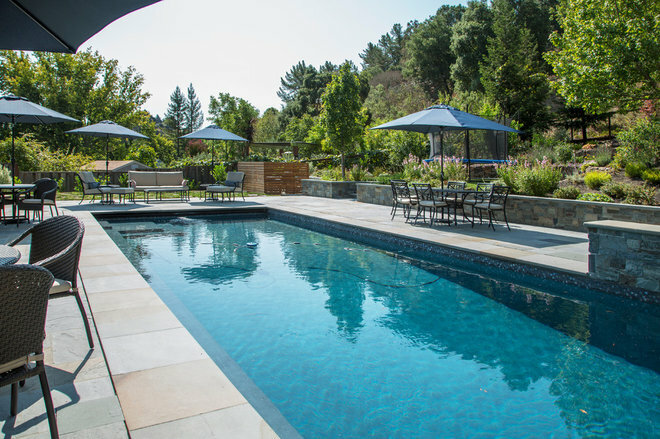 With the help of local design professionals, they divided it into four distinct yet seamlessly connected zones: a kitchen and dining patio next to the house, a spot for relaxing around a fire pit, a pool, and a play area complete with a trampoline, basketball court and treehouse. 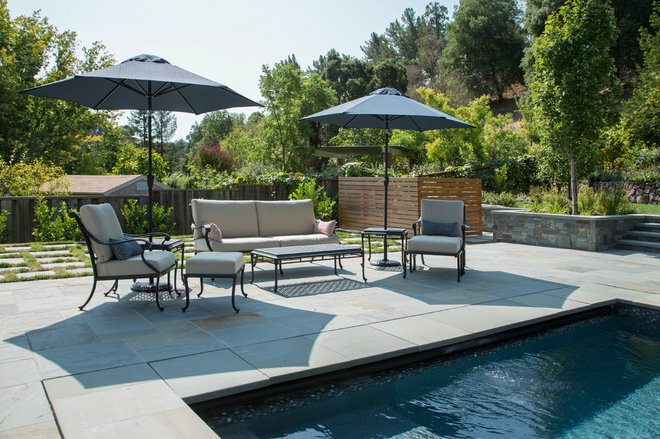 “We wanted the backyard to be functional, to include areas that would work with children and pets and would also be a place where we could entertain,” Rebecca says. 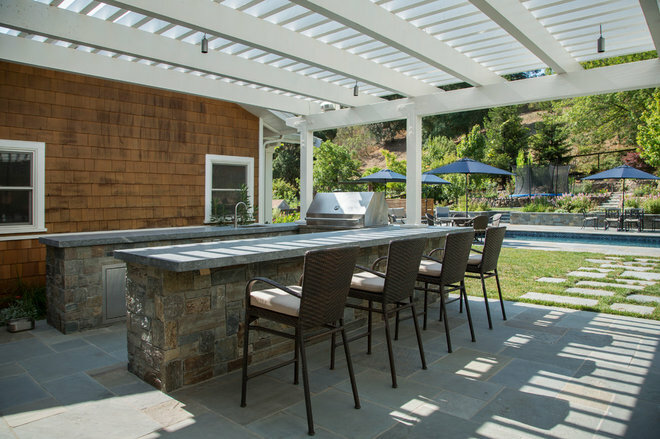 The patio, which is adjacent to the house, has an outdoor kitchen and bar as well as a dining set. 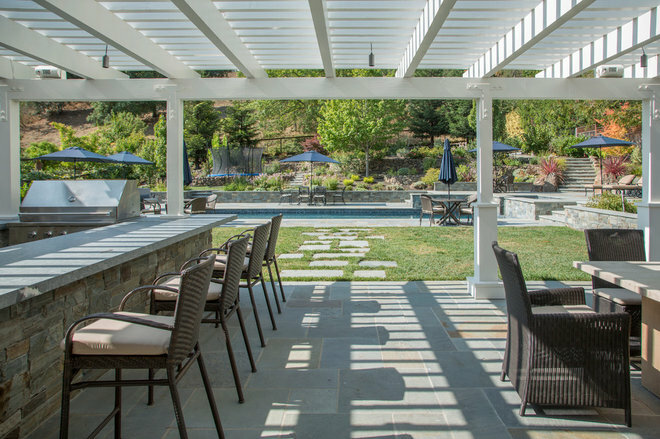 Paving and a wooden pergola define the area. 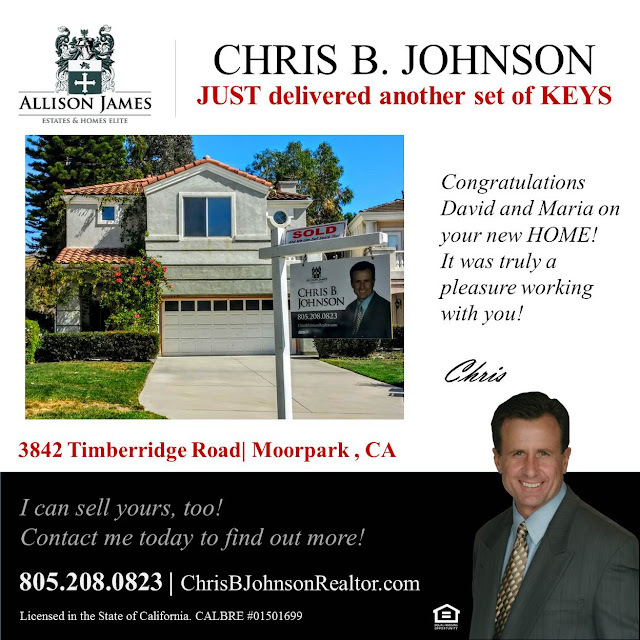 The Ahearns paid careful attention to connecting the indoors and outdoors by positioning the outdoor barbecue and food preparation area near the kitchen door for easy access from the house. Spaced paving stones lead to the master bedroom and farther into the yard. 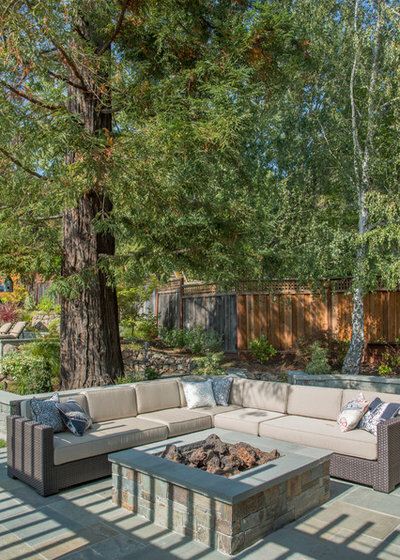 Just beyond the dining area, the homeowners put an outdoor sectional and a fire pit directly under a mature redwood tree, creating a spot to unwind. 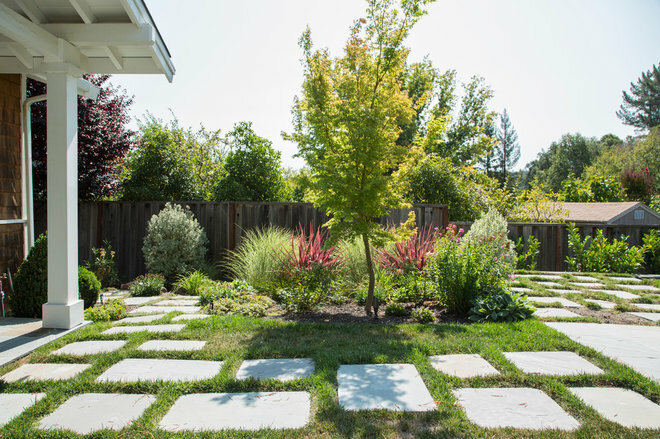 Gardens fill the spaces between each zone. 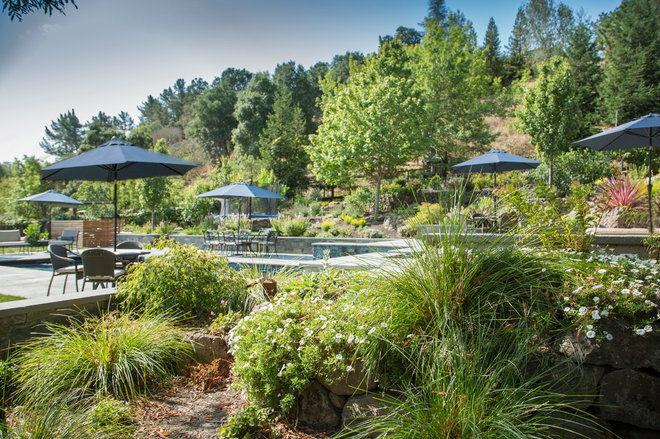 This one sits behind the giant redwood tree between the seating area and one end of the pool. 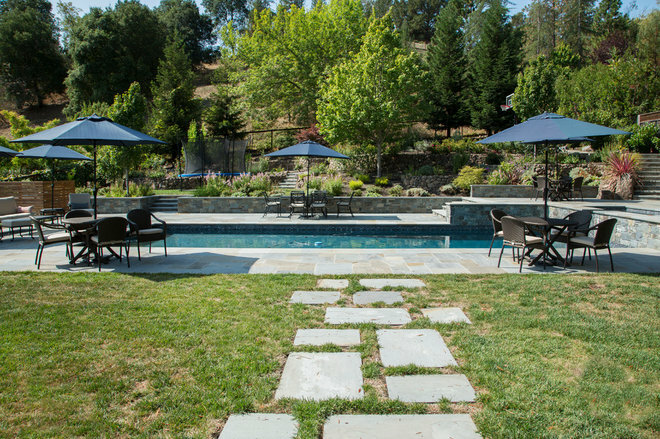 More pavers lead to the pool, where scattered umbrellas, tables and chairs provide places for relaxing and entertaining on the pool deck. 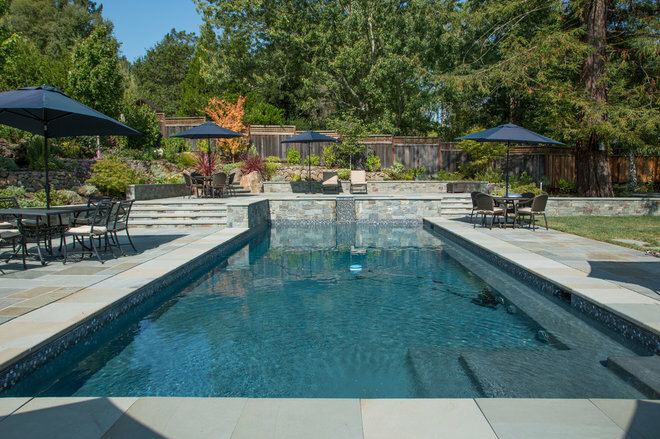 The pool is the centerpiece of the yard, separating the play area behind it from the dining and entertaining areas closer to the house. The pool has an automatic cover. 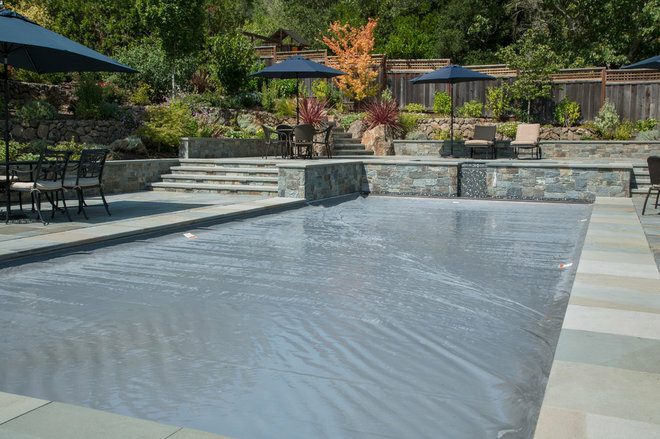 Not only does the cover warm the water and help keep it free of debris, but it’s also a safety feature in that it can withstand considerable weight without tearing. A lip at one end of the pool hides the motor and material for the cover. The pavers are removable for repairs. 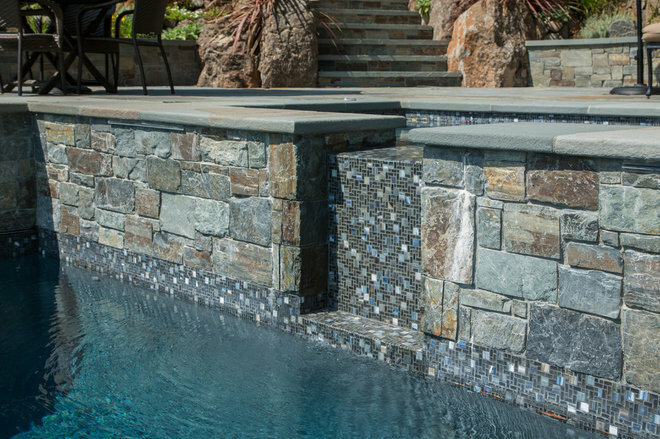 The hot tub was positioned at the other end of the pool to take advantage of a natural grade and create a waterfall. Water from the hot tub flows into the pool. Glass tile covers the inside of the pool to about the waterline. The redesign and construction started at the rear of the property and moved toward the house. The original backyard was grass with a step down to concrete. 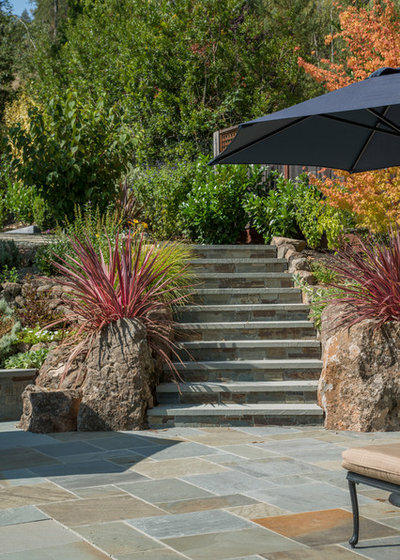 Stairways made of wide paving stones were incorporated into the existing grade to link the dining and entertaining areas with the play area at the back of the yard. Here, stairs join the play area and the pool deck. 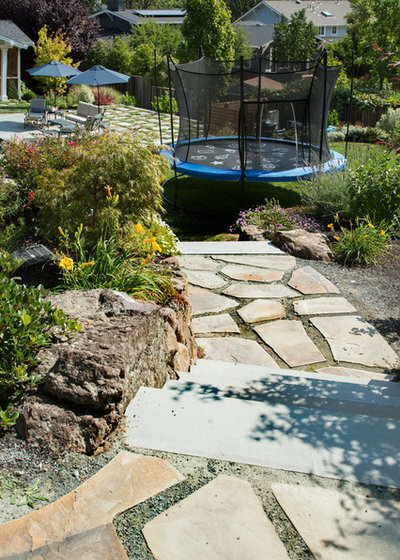 The trampoline, on its own patch of green, was a recent birthday gift to the kids. Another stairway goes to the basketball court. 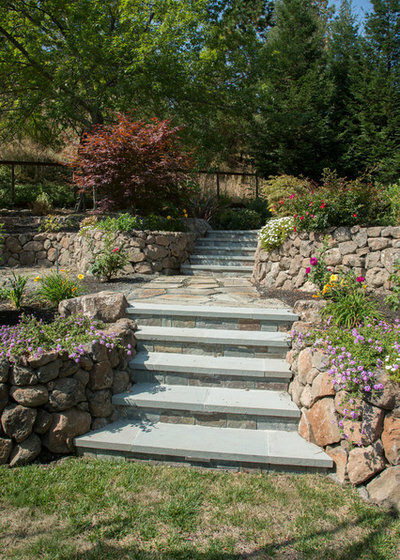 For visual continuity, the same paving stones are used for the steps throughout the yard. 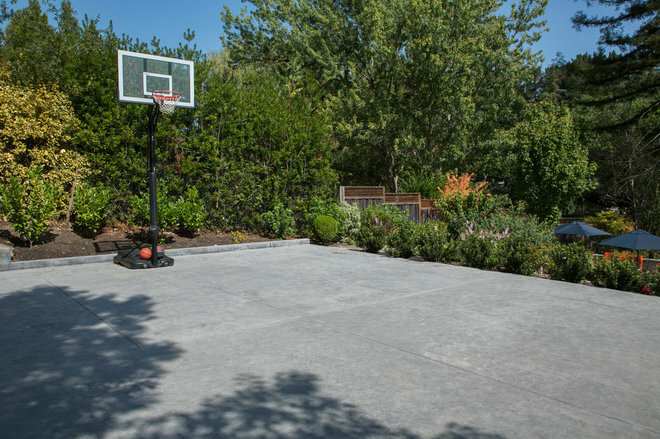 Easy-care, rugged landscaping surrounds the basketball court, at the far end of the property. 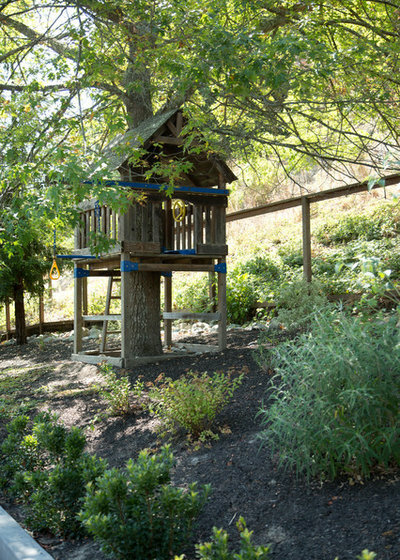 A treehouse for the kids sits at the edge of the yard against the back fence. 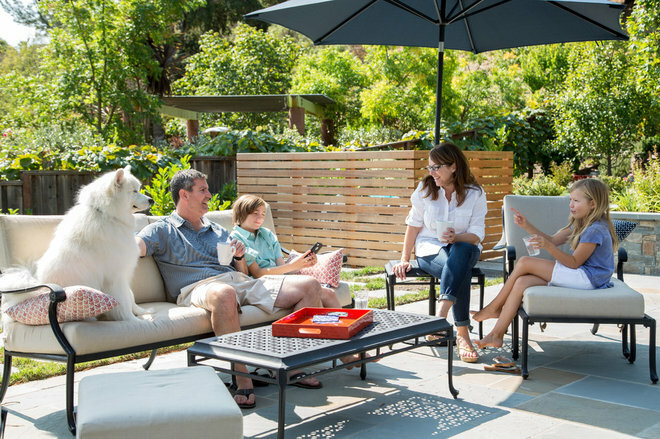 From left, Greg, Jack, Rebecca and Morgan kick back on the pool deck with their Samoyed, Teddy. 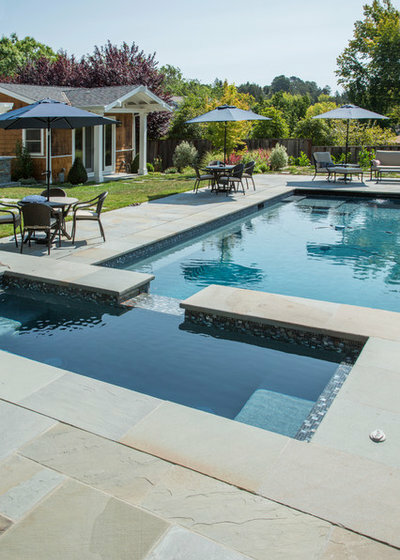 “When we moved from New Jersey to Northern California, we promised the kids we would have a pool at our new house,” Rebecca says. It looks as though they’re enjoying that fulfilled pledge.